League of Legends's next champion has been revealed. Kalista, nicknamed "The Spear of Vengeance," is Riot's latest effort to make players more helpful to each other. 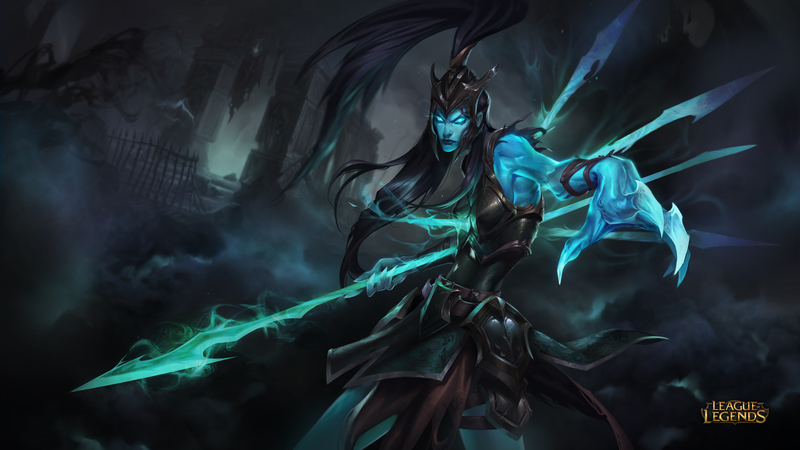 Kalista, one of the first champions announced since Riot began rebooting the game's story, is a murdered woman who came back to life as a ghost of vengeance. She can make a pact with another teammate that lasts the whole match. This enables a passive bonus called Soul-Marked. When she and her companion attack a target at the same time, they'll deal bonus magic damage. "Soul-Marked is designed to reveal effective duo-lane teamplay," explains designer Bradford Wenban. "Often in bot lane, a fight devolves into two 1v1’s happening near each other, rather than a 2v2 that’s won through cooperation between allies. Sentinel’s passive emphasizes what’s often the optimal play in these situations: focused fire." Kalista's ultimate Fate's Call is also based around cooperation with her soul-bound ally. Fate's Call teleports this ally next to her and makes them untargetable. Their spells are disabled but they're able to dash in one direction, knocking nearby enemies into the air. This ultimate can be used not only to save Kalista's partner from death but also to start a counterattack against the enemy team. While she's better with a partner, Kalista is a competent fighter in her own right. Her passive Martial Poise to leap in any direction after completing an attack. Her leaps are farther when she's moving away from enemies - making her great at kiting foes. The more spears she sinks into a foe, the more damage her ability Rend causes. Rend also slows down the target, helping her stay at a safe distance. The last trick up Kalista's sleeve is Sentinel, a summonable NPC that watches a small area. "[Sentinel] relieves your support (and likely Soul-Bound) of some pressure to keep up vision," says Wenban. "That way they’ll more often be available to work together to deal bonus damage and wreak havoc with Fate’s Call. This sort of design allows us to emphasize tighter, more consistent teamwork without making Kalista so communication dependent that you practically need to play in the same room as your Soul-Bound." You can see brief clips of her different abilities at the League of Legends website.